The King's Crown quilt block gives you chances to practice your skills on a variety of patches. The centre of this block is made with a square in a square patch. 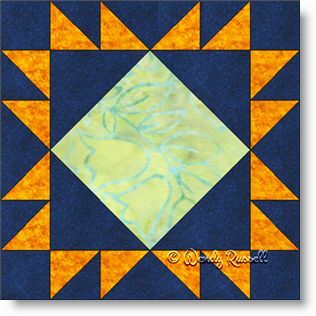 This could be the perfect spot to utilize a "fussy cut" square showing a specific motif, or as is shown here -- a simple plain patch where you can feature an interesting quilting design. The other patches used are frequently seen in a wide variety of quilt blocks -- the half square triangle, the quarter square triangle, and my favourite patch -- the flying geese unit. The two sample quilts illustrated both feature lots of free space to showcase your quilting designs. The sky is the limit!